The Duke and Duchess of Cambridge attended a reception hosted by the Governor-General and his wife Lady Cosgrove at Government House in Canberra this evening. William and Kate spent the day carrying out engagements in Canberra, which included a tree-planting ceremony, a reception at Parliament House and a visit to the National Portrait Gallery. Afterwards, the couple undoubtedly spent time with Prince George before changing for this evening's reception. The family are staying at Government House and have been using it as one of three bases during their tour. Approximately one hundred guests were in attendance comprising a diverse mix of representatives from various aspects of Australian society, including agriculture, the arts, business, charitable groups, conservation, defence, sport and youth. Many of the organisations have affiliations with William and Kate's patronages. William gazes at Kate. He's made some funny comments about his wife's style choices over the tour. I think he very much approved of this dress. The couple appeared to thoroughly enjoy the evening - their last in Australia. The black-tie event is the first formal evening event the couple have attended in Australia; they also attended an evening reception at Government House in Wellington, New Zealand during the first leg of the tour. The Duchess selected a black bespoke Jenny Packham dress for that evening. It is thought the couple chose to do it that way to ensure they could maximise their free time with Prince George. It's been a magnificent tour but I'm sure the royals are looking forward to returning home. Earlier today Kate spoke to a lady in the crowd who gave her a gift for Lupo: "Everyone gives presents for George but nobody knows how much I'm missing my own dog. This is the first present I've received for my dog and I'm really happy because I do miss him. He'll be really happy to have this to play with." Kate also revealed George has loved seeing boats at Sydney Harbour. The Duchess wore a cocktail dress by American designer Lela Rose. The Circle Lace Trim Dress from the 2012 RTW Collection features circular lace which adds a graphic effect to the sleeves and peplum waist of the beautifully fitted sheath dress. It's a beautiful dress and an interesting choice for Kate. It originally sold for $1,295 but is now sold out. Many thought we would see Her Royal Highness in an Australian designer tonight. A closer look at the detail from Farfetch. Tonight marks the first time Kate has worn Lela Rose, however the designer has long been suggested as a possible contender for Her Royal Highness. Lela hails from Texas and her aesthetic of adding whimsy to elegance through brilliant colour and handcrafted elegance has brought a fresh point of view to modern fashion. Lela has established herself as a renowned designer in bridal wear and ready-to-wear collections. Her clients include everyone from Cheryl Cole to Jenna and Barbara Bush. Looking through Lela Rose's collections, one is simply spoilt for choice when it comes to imagining possibilities for the Duchess. The designer is really a superb fit for her. 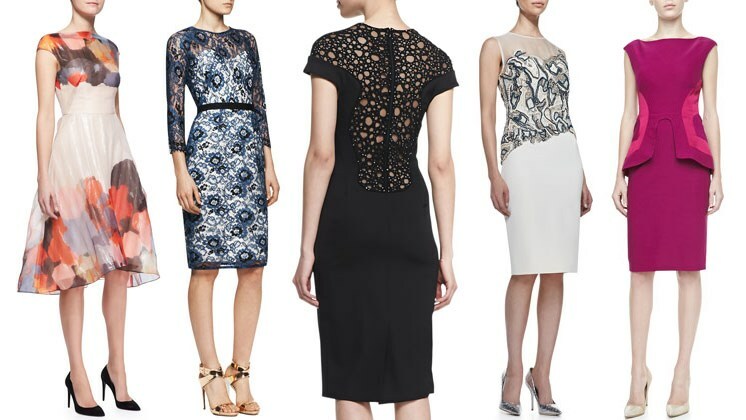 Below we look at several styles which would work well for Kate. 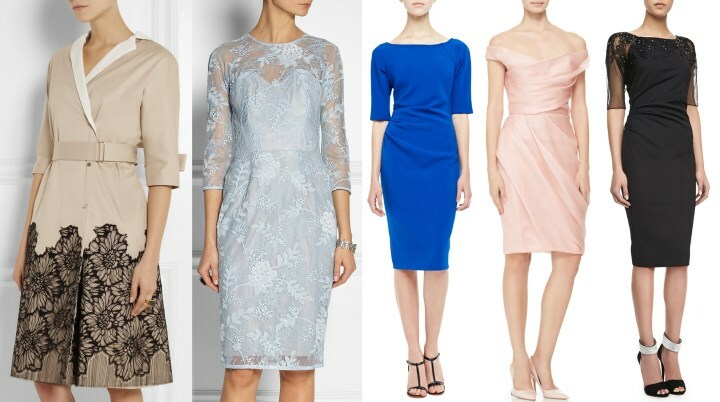 The colourful Draped Bodice Dress, the Belted Lace Dress (very similar to Kate's Erdem), the Circle Embroidery Dress, the Sleeveless Beaded Sheath and the Side-Seamed Peplum Dress. Other eye-catching pieces include the lace-appliquéd Cotton-Blend Trench Coat, the Chantilly Lace Dress, the striking blue Ruched Dress, the Draped Off-Shoulder Dress and the very pretty black Embroidered Dress. What do you all think of the label? Kate teamed the dress with her black suede Jimmy Choo Cosmic Pumps. Kate accessorised with her art-deco diamond bracelet and matching earrings, her Cartier watch and Mulberry Bayswater Clutch. I thought it would have been very fitting to wear the Australian Wattle Brooch tonight but it looks like it didn't make the trip. The Duchess wore her hair in a very elegant updo. It was splendid look for Kate, she looked beautiful. The Duke and Duchess will attend the ANZAC Day March and Commemorative Service at the Australian War Memorial. The couple will plant a tree in the Memorial Garden. After farewells, the royal party depart Defence Establishment Fairbairn in Canberra for London. Before we finish today. Many readers have expressed comments suggesting the Duke and Duchess do not appear quite themselves today. Unfortunately, as you may have heard there has been some tragic news in the family. The Duchess of Cornwall's brother Mark Shand, a tireless campaigner and conservationist, sadly passed away following a fall outside a charitable event in New York which resulted in serious head injuries. The family is devastated. The Palace said, "The Duke and Duchess of Cambridge were saddened to learn this morning of the tragic death of Mark Shand. Their Thoughts are with The Duchess of Cornwall and her family at this time." I love her hair tonight, but that dress is horrible. The hair is perfect but the dress is horrible because: Poor fit -I particularly notice the extra fabric at the arms, it just hangs w/o any particular give to the overall garment, the darts are a bit high for the bust, This is one designer she needs to lose. Lack of bling doesn't bother me here -anything on the dress would have clashed with the lace because of its strong definite geometric pattern (which seems too heavy and masculine), even a simple circular brooch. I can't agree with you about the fit. It is not too big or too long in the waist, that I can see. She is wearing a strapless bra allow a lovely strap- free look and this would account for slightly lower bust level. Not glaring though in my opinion. I think the skirt is a little high at the front but a few of Kate's clothes do this on her. I agree. I loved the hairstyle but I really disliked that dress. I'm sad the tour is almost over :( I'm going to miss your posts every day Charlotte. My how the time has flown so quickly. I'm sure W&K are glad that they'll be able to return home soon. I unfortunately do not like this dress at all. Something about the fitting of the dress is off and makes Kate look odd in all the wrong places. It's a little boxy, baggy on her and I don't like the peplum overlay. I don't think this dress accentuates Kate's figure at all. The top half is ok, I don't like the bottom. Do love the hair though. I wish she would wear her hair like this more often. I agree Blair. The dress isn't fitted well. Waist too low (almost at the hip) and the skirt just "hangs" folding all over the place. Our media covered this event earlier and the first shot we had was a close up of Kate's upper half. I really loved her hair (pure elegance) and the top of the dress. It was stunning. I imagined a floor length gown, but didn't get one. It was actually a casual affair, so I can understand the mid length dress, but the shapeless skirt and quite uneventful peplum did not desirably complete the look. Even a full lace skirt would have worked so much better. Their spirits seem a bit higher too since this morning. The mix of guests is quite a broad interesting range, so I'm hoping they experience and engage in some wonderful conversation. love love her hair like this! really don't like the outfit. I just thought "table cloth" when I saw it. Wow! That dress is beautiful, the hair looks wonderful, the jewellery appropriate. This is definitely my new favourite of the tour. The only thing that is a pity is that it is not an Australian designer. First of all I would like to thank you the enormous amount of work you did every day I know you love blogging as you have already told us but still. You were a wonderful guide during this whole trip. Personally I am exhausted even by just watching them, it is good we have a little break from them. The Duchess looked pretty tonight but not my fave look to be honest. She had a magnificient updo, at last nice jewellery although a brooch could do her right as well as in other occasions. But that ship is gone. I know she adores her mother-in-law but I wish she could go back to her style and I mean not just the eyeliner I know it runs in the Middleton family but the constant reminiscence of her by wearing the same colour or material or style. Instead of this maybe it would have been nice to see NZ and an Australian designer but not all hope lost maybe tomorrow. I know you will write a nice post on the summary of this tour but I can say now that my fave is still the 1st Canadian one. Thank you for reading! I agree with the too much eyeliner when you see it close up, but from a distance it does define her eyes well, so its probably just so she photographs well. You know, like stage makeup. Many brides do the same. It looks way over the top on the day, but in the pictures it looks great. I love her hair...it's just stunning. Unfortunately, I think the eyeliner is an attempt at the "Smokey eye" which I believe to be out of style...very Hollywood. Overall though, I love this look. Agree -a soft smoky look might have been nicer -use of a brown/black instead of black by itself would help. Time for an update at the Bobbi Brown counter. I like the dress from far away, but up close I'm not too enamored. Her hair is nice, because it's up finally, but it kind of looks messy. All her chignons have been low. She should try higher ones too. As a Sydneysider I completely agree with everything you say here. I'm 26 and normally love what she wears and follow this blog even though I am a republican, but I am honestly so dissapointed with her choices. Totally agree with you Claire. Sadly, she seems to have missed the mark with who to choose. She does not wish to be known for her clothes but they say so much and Im sure she is fully aware of the power she has in regards to clothes. I too believe its a bit of a slap in the face in this instance. I don't believe recycling should occur on tours for the one reason that countries put so very much into each occasion that its a bit insulting that Kate looks as though she has not. Recycling is fine for home. When have the Royals ever worn local designers? Like so many others, I think wearing an American designer to this function was a major faux pas - especially since there were a bunch of Aussie designers at this reception. One of Kate's main functions on these tours is to highlight local designers as she did very well in Canada and S. Pacific. Not only that, but this dress was definitely aging and would have looked a lot better without the lace peplum and maybe a strappy sandel instead of black suede pumps. Mary of Denmark does fashion so much better. Luckily Kate if tall, thin and gorgeous and can pull off any look. Just a thought on recycling. For those of us who see her clothes in the media, getting to see them up close is a real treat, even if they have been worn before. So recycling isn't insulting but perhaps a kindness. I always remember the thrill in Canada of seeing her engagement picture dress up close. I just read when Charles and Diana came 30 years ago, Diana wore ALL designers from England to promote them. When the Queen travels, does she wear the local designers? Could this be something Kate herself started with the Canada and Asia tours? Give her a break. Since the dawn of time, Anonymous. Diana did, and there was a LOT of talk before the tour of which designers Kate would choose. If the royals don't use local designers (the Queen, for example), there is always a nod to their hosts -- as in the fern brooch for New Zealand and the wattle brooch for Australia. It may not be Royal protocol to wear local designers, and Kate may have made a concerted effort on this trip to keep the fashion talk to a minimum, but I think it would have given them oodles of goodwill to spotlight up and coming talent and local fashion while still sticking to her classic style. Surely her staff could have helped with research? This makes me wonder, what does Kate want her legacy to be? Perhaps she doesn't know yet? Or is just focused on being a good mother, wife, doing her part for the Firm and bringing attention to a few causes here and there. If you are still wondering why Catherine wore the New Zealand Fern Brooch but not the Australian Wattle Brooch you might want to check the following links. You will see that the two brooches have very different significance. With William and Kate somewhat travelling in the footprints of Charles and Diana, the main reason could be that HM wore the Australian Wattle Brooch for Charles & Camilla's wedding. I think there have been several ‘nods to the country’. – and after the reception – Jonathan Howard hat (local), poppy brooch (gift of Corporal Ben Roberts-Smith V.C. 's wife), sprig of rosemary (ANZAC Day). I am wondering whether this 2012 dress might have been brought just in case. This “case” might have occurred with the sudden death of the DoC’s brother in New York. White being an accepted colour for mourning, Kate’s wearing it could be appreciated by Camilla. I would also not be astonished if the Cartier watch was a gift from the Duchess of Cornwall. Kate did not wear it during daytime in Yulara/Uluru where Charles visited with Diana. But she wore it this evening. It being chuncky would correspond to quite a few pieces of the DoC's jewellery, who is wearing a Cartier watch herself. ‘Mourning’ might have trumped ‘nod to the country’. Had Kate originally planned to wear a dress by an Australian designer – even with the Wattle brooch? Who will ever know. As far as I remember, Catherine wore 0, 1 or max. 2 dresses by ”local”/local designers during her first two tours, and most of the time 1 “non-local” one. Most of them were by award-winning [aw] designers/brands and accessible in London. She also wore her well-known go-to-designers as well as other British brands. So I suppose there hasn’t been any real difference between the three tours as far as dresses are concerned. What has changed: She has a baby to look after now. So disappointed as an Australian - why choose an American designer for the first time when there were so many great Australian designers she could choose from. No Wattle brooch so far maybe tomorrow for Anzac Day - fingers crossed. A disappointing day - all the hype about Aussie designers and only Zimmerman (lucky them) and Oroton for their blue bag in Brisbane and Oroton is beautiful - I love it! Catherine's green outfit today was so blur especially for a bespoke version - thank goodness they were not in Sydney today at 29.5 degrees celcius - very summery! Hope tomorrow brings an Aussie designer and the Wattle brooch for Anzac Day. Its kind of weird why she chose to wear two different styles of green coat on this tour. Agree with both anonymouses. Those two green coats are so alike I wouldn't fault someone for thinking it's the same one. I think just because of the way she stoops and holds her hands under her belly she looks like she has more of a tummy. In these pictures, yes, that is a factor. But look at the first picture of the Uluru post. It's very evident there, without stooping. Or where the toy dinosaur pressed against her leg in the poppy dress. You see a definitely curve line. I'm reminded of that green high-waisted dress, very buttoned up, she wore with her new bangs when we still didn't know she was pregnant. Too low or too high necklines to divert attention, makes me think. I actually met her and she is tiny. About a size 6-8. She has a tummy because she stoops a bit and sticks her tummy out. She did have a baby and maybe she still has a bit of the mummy tummy just like the rest of us. And if you call that a tummy there is no hope for the rest of us! Kate definitely doesn't have a mummy tummy, just look back at the photos of her playing volleyball. I call that a tummy in comparison to her standards. She had totally lost her baby weight. charlotte great work this tour! thanks for this quick update, i was so curious what she was wearing. I was a bit shocked with the white dress at first but she looks incredably fresh and it also matches very nicely with william suit. her hairstyle and earrings make it a very distinguished look. i am going to miss these 2 daily posts, thanks again for the amazing covery. Oh Wow! Understated elegance and beauty. Catherine does it with grace. William and Catherine's last evening, so very special. God bless. She looked tonight very much like her mother. I can see a strong resemblance. Not usually, but today. I read an interview with Australian designers. They were not disappointed that she didn't choose them, but said Catherine should wear what she feels comfortable wearing. They also said that they had loved her choices as they were classic and not tied to trend or fashion. I must say that I completely agree. I do think she's a bit more curvy since having George. Pregnancy and babies will do that to a woman ;) She's still so tiny, though, and I think that this dress with the peplum gives the illusion of more curves than she actually has. Truly disapppointed by today's choices. I was eagerly waiting for a stunning evening dress but this is .... Wrong! It makes her look older, badly fitting, def out of place. I can see understand thosa who complain the lack of local designers ... To favour a texan new entry. I really really hoped for a more glamourous conclusion. Why is she so sad on this part of the tour - It seemed Kate had a great time in NZ but has struggled in Australia. Maybe she is unwell. Nickydroo, the royals are smiling and laughing in 90% of all photos and are totally engaged in everybody they talk to and meet. I don't know where you get that idea from. Are you just trying to stir the pot? Not sure I agree nickydroo. I felt Kate and William absolutely glowed on their trip through our land. I've never seen both of them so happy for a very long time. However, there was a definite lack of spirit yesterday from the minute they got off the plane. My thoughts were that maybe George was unwell, but it made sense when the news of Mark Shand came to be known. Even this morning at the arboretum I felt Kate wasn't quite in sync with the crowd (even with the littlies). It was a very sudden unexpected death and the shock itself can throw any "professional" out. I noticed things did change for the better this afternoon during William's speech with the Prime Minister. His tone and mannerisms did step up a notch and Kate seemed more attentive this evening. I hope they end their trip on a pleasant note. Although tomorrow is ANZAC day here. So it is a time for reflecting and being thankful for those that gave up their lives and those that continue to serve, to keep our country a beautiful place to be in. The dress is too mature looking for the Duchess, more for someone a lot older. The eyemakeup is very heavy it is inclined to be very aging and hard looking. There is something off with William looking at him walking through the passageway he looks a bit off, something not sitting right with him! I too will be sad to see the tour end BUT I'm really, really disappointed and perplexed by Kate's reluctance to wear Australian designers during her time in Australia. We have so many amazing labels here, both high end and high street. For example, I could easily see Kate in a Carla Zampatti gown for this occasion, or something from Cue/Veronika Maine for a more casual event. Some may not agree with me, but given that royal visits are designed to highlight the best that a country has to offer, why not add the nation's impressive fashion industry to the mix? Australia has PLENTY to offer and I think that as a stateswoman whose fashion choices attract worldwide attention, she really ought to have worn predominantly Australian and New Zealand labels while here. This is even more the case given that the Queen is our Head of State and Kate and William are representing her on their visit - she has much more of a duty to promote Australia than she would, say, America or France. It's almost unpatriotic in some ways to have not flown the flag for Australian fashion. That said, this was a pretty dress - nothing spectacular though. The hair looked lovely, but the watch was a terrible choice in my view. It needed to be left behind on her bedside table as it really doesn't suit the formality of the occasion. Thanks once again, Charlotte, for a great post! Totally agree about the watch and thought it too chunky every time she wears it, much better suited to casual attire. Otherwise I think it is an elegant look. I also agree about the watch - it's a beautiful watch but there have been several occasions she has worn it and (IMO) she did not need a watch. It was the last event of the day and surely someone else could remind her if it was time to go. The watch also clashes with the beautiful diamond bracelet on her other wrist. If she must wear a watch with a formal outfit, I think a smaller face and a thinner band would be more elegant. I agree with you. I´ven been looking over the Carla Zampatti´s web and i´ve found a stunning white dress: Snake Audrey, and all her designs are fantastic and femenine, take a look, please!!! I was going to say something about the watch too. She needed a great vintage cocktail watch with this dress. Would have looked fabulous. Couldn't agree more about the watch and it's been very much bothering me. In fact a Miss Manners column appeared last week in which someone wrote in about a bride wearing a watch on her wedding day. Miss Manners said you only wear watches at formal occasions if you want to give the impression that you need to check the time to get on to a more interesting engagement. So at a formal function, the watch is inappropriate. I didn't care for the watch with the formal look and I'm not a fan of large watches in general, but I suspect that William gave it to her and she is proud to wear it. I honestly do not think she would do anything to be disrespectful towards their hosts, etc. Likewise for not turning the tour into a fashion parade for local designers. Yes, it is a nice touch, but given the footsteps she is following in, Kate has been on a mission to avoid the title of clothes horse. I support your point, Anon 12:26, and I'd like to add that we shouldn't forget that at the moment, Kate is "just" the wife of The Queen's grandson - and still far from being the Queen Consort. So I think it very appropriate that she went without a lot of glitz and bling, but reduced her style to a modest but distinct elegance in many places. Lucida, your observation is spot on. While some have already crowned Kate as queen, she's a bit of a distance from the throne and is still the wife of the heir to the heir to the throne, not the Princess of Wales as Diana was. The queen herself doesn't trot about in tons of bling, tiaras are worn only at state dinners, for portrait sittings and at the opening of Parliament. So it wouldn't be anywhere close to appropriate for Kate to plop a tiara on her head for every outing. Besides, large amounts of "statement" jewels still tend to add age. You don't see a lot of younger women, even wealthy or royal young women, out and about dripping in jewels. one smiles 24 /7. Maybe she just missing home. Charlotte, thanks for covering the tour! I must say I didn't love most of the clothes she chose this time, but reading your posts was great fun anyway. You're very good at this. I don't understand why she never wears trousers, with the exception of skinny jeans which are very comfortable but not (in my opinion) suitable for an official engagement. There are so many beautiful (even very elegant) trousers, with different cuts, lengths, shapes, and also so many different kinds of jeans! As for the shoes, I like what she wears most of the time and I am the very happy owner of a pair of Rhumba boots and of the Minx wedges, but I would love some change and especially more sandals... maybe strappy sandals? with spring and summer outfits of course. Today's cocktail dress is nice and elegant. Nonetheless, I think it would have been much better without the peplum detail (I really don't like that), with a lighter make-up and different shoes, in a lighter color, or maybe sandals with a nice color on her toes. So agree about the shoes -even those hard-working LKBennetts might have been a better choice than the starkness of the black. I love her hair and makeup, and I think she is doing a great job smiling and looking attentive and interested when she must be exhausted and want some family time away from cameras! I have loved Kate's fashion on this trip but agree that this dress is not my favorite. It makes her look a bit shapeless and I wish there were something to add more color to the bodice--like a brooch or chunky jewelry or something. I know she's not a fan of statement pieces for jewelry but I can't help but imagine how good they could look on her. I also was surprised she wore two green coats that look almost exactly alike.... Charlotte, it would be great to see a side-by-side of them at some point. Thank you for all your hard work! I've loved this blog and I hope you get a vacation after their trip is done! Wow, the dress is truly terrible. Not glamourous at all, it looks more like a day dress. And like you said Charlotte, many thought she would choose an Australian designer. I wouldn't have minded if she wore a UK designer,but American??? I am also an Australian and am very dissapointed. I think was the worst fashion choice she has made on the tour. She could have worn a wattle brooch, as someone suggested above. Kate's hair and make up do look lovely. I like the updo. I would like to thank YOU Charlotte for your absolutely stella coverage of the tour. No matter anyone's opinion on Kate, no one will disagree that you did an awesome job. Especially with the time difference. I'm sure you'll be catching up on much needed sleep over the weekend. Wow, what's wrong with American? She looks amazing. Hair is stunning and she seems to love the peplum style right now! Very disappointed she hasn't made the effort to wear an Australian designer (other than the clutch). I understand wearing British designers, but I don't think she should be wearing this and Erdem Down Under without making more of an effort - even if their designers *say* they aren't bothered (who wants to look like a sore loser?). Anyway, thanks for the quick posting! Well, since yesterday, with the sudden death of Mark Shand we know at least one reason why she might be not so happy as in NZ. I wondered if we would see some sign of mourning on the couple today, but obviously not. We don't know how close Shand was to the Royal Family, albeit his sister. Now why on earth would William or Kate care about the brother of his step mother? Perhaps they are human with compassion! Something evidently lacking in today's society! Anon 1401- not so sure about humans owning compassion. I just watched a PBS program about snow monkeys. It showed a mother with a tiny baby being drawn to the cries of another last or abandoned infant. She walked away initially, then returned, lifted the baby up and rescued it. She adopted this baby and tried to care for and feed both infants amidst mounds of snow. journal..diary...correspondence..where is my thesaurus?! Will miss you all but my cats won't!!! Or maybe she just did not like any of their desgins. I really like this dress. I don't normally like white but I think I really like this dress. I think I would have chosen the black one on the second row, I also LOVE THE MAGENTA the model is wearing in the runway! Magenta is one of my favorite colors, so I'm biased. I just think in most pictures she is standing a bit hunched/curved and looks a bit defensive. I read somewhere that Princess Mary of Denmark is very popular and loved in Australia and that since she became a royal attitudes toward royalty have changed in Australia. That Princess Mary somehow "helps/benefits" the concept of monarchy. Do you believe so??? I saw a picture of W & K in front of a huge portrait of beautiful and regal Princess Mary and I remembered what I had read but I had not asked before and I am curious. Aussies just love Mary, girl from down under marries a prince, it's a fairy tale!! Everyone loves her grace, style and elegance, people are proud of her. By the way her portrait is stunning!!! Shame Kate's didn't turn out so well, I'm sure there will be lots more in the future!!!! Catherine generally has excellent posture; however, as soon as I noted the raglan sleeve on this dress it confirmed the problem everyone wearing it faces. It gives the appearance of being round-shouldered. The catwalk models, you'll note have very squared shoulders and are holding them back for the photographs. A normal woman in movement with this particular cut always looks a bit tired and worn--no matter how fresh the colour or the lace. It's a flaw of the design which is why I have never worn it after getting my first experience of it in my teens. As for the fit and sewing of the clothing on this tour, it's not the first time I've noted flaws in very high-end pieces the Duchess has worn. I suspect that she cannot be having final fittings for all of the pieces, that some of them are sent over to the palace after being made to her measurements. In the case of the pink skirt, that flaring cut has to be pinned while the person is wearing the garment to get it even. That was covered in first year Home Economics. The pressing of seams and so on, would be the responsibility of whoever is in charge of her wardrobe for the tour. Someone other than Catherine is unpacking and hanging the clothes. A professional wardrobe mistress or dresser, if she had chosen to use one, would have taken care of that. In addition, with a schedule as hectic as this one has been, it's quite possible that Catherine has lost some weight during the tour. (That regularly happens to me when I travel internationally and my trousers literally drag on the ground after a couple of weeks.) If that is the case, it would also account for the fit not being spot on. I'm an American fan of Kate's, and I have to say...I really don't like this dress! Kate would look beautiful in a sack, let's face it. And she'll never please everyone with her sartorial choices, that's a fact. But I would have liked to have seen more Australian designers since, as someone already said, it's a sign of respect toward the host country. (Additionally, I'm in complete agreement about the green coats - major "eh"). As a royal watcher from around 2003, I have to say that if it's ever Mary versus Kate, I'm for Mary. As lovely as Kate is, Mary has the edge: seemingly even more down-to-earth, very maternal (as is Kate, it seems), and quite the snazzy dresser. She takes more risks and shows more whimsy. Kate either plays it safe or "off". All that being said, it's William's opinion that matters most, and they seem delighted with each other. Lovely to see their compatibility on display! @Anon 24 April 2014 14:18 - Yes, I have seen the portrait. Impressive. @Philly, I remember reading Kate likes to choose her own clothing and get them ready herself. I guess those minor "problems" are the reason why experts must be hired. I would not know about your recommendations either... I too believe she lost a bit more weight (maybe due to stress and all the hectic preparations) right before the tour. I think she looks stunning in the white dress and the hairstyle is perfection. Perhaps tomorrow morning at the Anzac Day ceremony she will surprise us all and wear an Australian designer with the wattle brooch. You have done an amazing job Charlotte in updating us all - now you need a good night's sleep or two ! Great blog Charlotte - have been following avidly! I wonder if Kate has been deliberate playing things down on this tour to avoid too many of the, obvious, comparisons to Diana? No matter what she wears, someone will dig something out of the files to compare it to Diana. That's what the press does no matter what the truth of the matter may be. That will shadow Catherine's sartorial choices and her actions all her life. When Diana was at this stage of her marriage to Charles many of her fashion choices were downright frumpy and appalling. The only one who trumped her was the Princess Royal. Diana came into her fashion own when she parted from Charles and the palace. Catherine has been confidently and consistently her own classically-styled woman since she began her relationship with William. Loved Kate's entire wardrobe on tour but things headed south post Uluru. The light pink & bright green outfit from today were well beyond her years! Disappointing she didn't wear an Aus designer tonight or wattle brooch, would have been a nice way to end the tour. They both look like they can't wait to get home, it's a long tour and there are only so many meet & greats and tree plantings you can do!! Also must be hard having George on tour I'd imagine that would add a lot more pressure. Nice to see them in Aus-well done! I like Kate's dress, but not the peplum. The cut-out design should have been continued to cover the bottom portion of her dress or NOT repeated at all. In my opinion, very few peplums are flattering, even on someone as slim as Kate. I just don't understand why people think it's so important to wear fashions of "native" designers. I am American, I could care less which designer she is wearing. It shouldn't be taken as a "snub" to Australians. Too much is being made of this. Her hair looks lovely, but I do agree with others that she needs to lighten up the eye make-up. I hope as she ages, she will discover that "less is more." As for the comments about both W&K not smiling as much. None of us have perpetual smiles on our faces. Try it sometime. You'll discover how tiring it can be. And with photographers taking photo after photo, naturally some will show them looking more serious. I'm sure the news of Mark Shand's death has also cast a cloud on their last days. It must be so tiring traveling from place to place, trying to look perfect, greeting so many people and basically being on your best behavior for weeks. I have great admiration for them. Their critics accuse them of loafing to much. I think they have made Britain proud! What wonderful ambassadors they are! Well, America is not part of the Commonwealth, so there's no reason you would care..
Daisy, I agree on the eye makeup. I remember that a thick lashing of blue eyeliner was Diana's trademark when she first married and that disappeared over the years as she grew more aware of her own appearance and received advice from others. I think one of the reasons so much is being made of Kate refusing to wear many Aussie and NZ designers is that whatever she wears brings attention - and sales - to the designer. I think people were hoping she would, by wearing some Australian designers, bring some of the "Kate effect" to designers in the host countries. wow, "america is not part of the commonwealth, so theres no reason you would care"? wow, here we go again! I am also sick of everyone whining about the lack of NZ AUS designers while in those countries, then to follow she should only wear british designers at home. picky picky. great job charlotte. think ill post under anonymous instead of my regular name, seems to work for some. Thanks for the great post, Charlotte. I, too, look forward to reading your blog. Kate's choice for today was beautiful; she looked both fresh and elegant. The pressure she must be under to "get it right" all of the time must be exhausting. All in all she looked beautiful during the tour, and I am sure her country is very proud. Can't wait to see Prince George again. Not sure if others have seen this but there was a lovely article in the New York Times about Prince George's fashion. It included an interview with Rachel Riley, who called dressing George as "life-changing." This is off topic, but I was just wondering why kate has never re-worn her 2 gorgeous Erdem dresses from Canada? Is there a specific reason? She has many beautiful dresses from tours which she has never re-worn (e.g. lilac Alexander McQueen from the U.S. Is Kate allowed to re-wear clothes from tours? I don like to disapprove of the Duchess' wardrobe choices, but I am utterly disappointed that she only wore one Australian designer on this tour. As an Australian my self I may be slightly biased, but a designer such as Carla Zampattii would be perfect her. I am also upset that she didn't wear the Australian Wattle brooch. If he can wear the New Zealand Fern then why cant she wear the Australian Wattle??? If she truly does have a bump, I hope she takes George and they both go to stay with hr parents and skip Guy Pelly's wedding. The Cambridges have all 3 done a tremendous job the last 3 weeks. I'm sure William and Harry could attend the wedding and let her get some TLC and privacy with the Middletons. Kate seems to really have had an affinity for wearing a watch lately. Although I don't favor a watch with more formal events, I do wonder why the sudden shift in her watch wearing. The portrait of Princess Mary is simply stunning - hopefully we will see a similar one of Kate soon! I for one love this dress! I think it's modern and young. The geometric detailing is very unique. The dress maybe doesn't fit 100 percent. I think this is a different look for Kate who rarely wears white. Her hair looks lovely pulled up. This is one of my faves from the tour. Yes, I was hoping for a long gown, but I do love this look! I think Kate has really shown herself to be quite fashion forward this tour- she's really gone with some looks that I would consider to be "fun" and "high fashion" for a woman of her age and well, income (the yellow dress, this white dress, the green coatdress from yesterday). I commend her for taking some risks/trying new things on this tour! For all evening events, Kate repeats the same jewellery - earrings and bracelet, which is supposed to be a gift from Charles. I am sure she has a lot of choices in diamonds. I have to laugh at myself, the comments we make..someone else's life. Nothing changes...The Queen herself was also criticized or at least mentioned many years/decades ago for wearing the same shoes...for being frumpy...and when hit with huge disappointment for not wearing her fabled jewels she responded by decking hrrself out as only she can and said "I gave them my best bits." And so it is for Kate. Does the portrait of Mary look rather imperious? Also..the NZ part of the trip had more fun sporty elements and in Australia it was far more predictable and prosaic. Iagree that she needsa delicate and more elegant watch for some occasions and outfits. Charlotte, love the blog, you're always the first one with all the news…you rock! As for our "leading lady," she must be exhausted and probably can't wait to get home. Didn't love her choices this time around. Nothing special. I think she did take some notes from the Queen…everything was nice but nothing stood out. Hopefully, next time there will be a little more pizzaz! I'm torn between two different feelings about this dress: at first sight I was wowed, and I said to my self that I was glad to finally see something more structured and unusual comparing to the others; then I notice something wrong in the shape and in the fit. But finally I can say that I like it, expecially because of the great updo.. so elegant.. wow.. I really like the cut work in the dress but as an American I can say what was she thinking to not wear Australian designers or at the vary least a UKmdesigner. Her clothers on this trip are lackluster dowdy and poorly fitted. As for tired two forty five minute engagements should not wear out a few 30 somethings. They are so used to not working that it shows when they do these minimal photo opp engagements. Now we won't see them for months. This is my absolute favorite look of the whole tour! She hit it out of the ball park with this white dress! My second favorite is the red one that she wore off the plane in New Zealand! I think Kate did an absolute wonderful job!! Oh, I do love Kate in a chignon. It always kicks the elegance level up a notch when her hair is back, and since she does it so rarely it's always an exciting occasion! I quite like her dress and it's different than anything else we've seen on the tour, so I'm happy. Another great post Charlotte! Such interesting opinions about this dress, but it seems that I'm in the minority that really likes it. I think the detailing on the sleeve and peplum is beautiful and adds a lot of interest- something that has been a bit lacking in her choices lately. Lela Rose is a designer that I think could be perfect for Kate, but I can completely understand why Australians might be a bit upset that she has not featured more Australian designers. I also love her hair up and think that this is a lovely style, but I do agree with others that she could really lighten up on the eyeliner. Sure it defines her eyes from a distance, but so many photos are closeups and it still looks to heavy to me. I also wish that she would wear a bit more color on her lips when she wears lighter shades (this white, the light pink, and the dove grey) because I think she looks a bit washed out. Also, one of the previous commenters made a good point about the watch- I find it to be a bit too casual to be worn with many of the outfits she has paired it with. I absolutely love her hair like that! No matter what she wears, this updo adds instant "elegant" and "Princess" to it. I quite like the dress and think it was a great choice. I may be in the minority, but throughout the tour I have really disliked Kate's hair. Most days she had it down and it was just blah. She had a hairdresser with her, but I could have done a better job styling it. I know hair changes after the hormones of pregnancy, but her hair has been so boring recently; not just in how she styles it, but the cut and color. I wish she'd go back to her engagement hair... it was darker and much more beautifully styled. A very Crown Princess Mary look for Duchess Kate. I love the hairdo and the makeup. Very chic and pretty! I am not a fan of that dress, though I think she normally looks stunning in white. Has anyone else noticed that Kate is recently wearing a third ring on her ring finger? It looks like an eternity band. I wonder if it was a gift from Prince William celebrating the birth of Prince George? This was great, very fresh and cool yet elegant as well. I'm sure Mark Shand's death has cast a pall. All the UK reports say that Camilla is, understandably, shattered at the news of his unexpected death and that they were very close. He appears to have been very active and engaged in endangered animal conservation, particularly Asian elephants, and a very likeable guy. William and Harry, by all accounts, are fairly close with Camilla or as close as they can be and I'm sure the news is hard for William to get, he's three days' away from his father and Camilla. Not to be too morbid but it could also affect whether or not William goes to Guy Pelly's wedding. I expect that William will attend the wedding, he and Guy Pelly are and have been very close friends and it would be a tremendous snub for William not to attend. I really like the dress and think a lot of the designer's pieces are very Kate like. I hope she tries more in the future as I think they suit her well. With that said, I agree with an Anonymous poster wayyy up there that I like her hair but it is a little messy in the back up close however I am glad it is up. One thought on the designer debacle, we all know Kate is a stick and tends to go with a mix of off the rack and bespoke pieces. For fit on someone prone to rapid size change based on my own skinny time when stress from traveling meant losing ten pounds - two sizes down in just a week's time or if she is pregnant as some think when size is tricky too, Kate may be doomed to guessing right now. She might be pregnant and trying to anticipate sizing. It might have been very hard for her to figure out fittings for bespoke work since Aussie and NZ designers cannot just take a car over and make a day it. I realize she had the American designer but truly do we have an idea of how long she might have had a piece that she hadn't worn yet? She probably does have some items in her closets for some time that she may nix for something but wears later. We don't know. If my dream comes true and Kate ever invites me to go through that closet, I will be delighted to let you know what I find but until then, I don't think it's fair to think Kate snubbed the designers or the country or whatever. She does not come off as a mean spirited person and her thoughtfulness does show for other things so give it time. While I would have loved to see some of the native designers be showcased, there will most certainly be time again when Will and Kate travel to both countries and I bet she will wear more of the designers' pieces based on the feedback from this tour. Logistically, she is trying, it didn't work out and maybe we will get a fun announcement and everyone will go- that's why the clothes were loose or whatever. She is living under constant scrunity and judgment. I am just grateful to see a person who realizes that what she does and how she does it is important to her country and to her family. She will never please everyone every time but the skirts being lowered shows she is attempting to improve her public persona. I agree with most of you, I don't like the peplum either. She should have worn a dress by an Australian designer, it would have meant so much to them especially since this is only the second evening look we've seen. Other than that I thought Kate's hair and make-up looked beautiful. She's always stunning but this dress was a miss, in my opinion. Happy to see her doing something different to her hair. She looked very elegant. But i preferred a the Asian tour wardrobe. Her makeup is so beautiful. I love those smoky eyes. Lovely ensemble. I like many dresses in the Lela Rose brand, but NOT this one. Really, the lace was a big turn-off to me and not flattering to Kate…and that takes some doing. I also don't love Kate wearing these international brands…and I'm an American. The royal family is sort of the ultimate way of promoting "Brand Britain", and Kate should support UK designers when on official duties. Diana did this so well, as I believe she virtually always wore British designers when on "official" duty. Here is one place where Kate would do well to look to Diana's example. Of course, I do also think that Kate should have made more of a nod to designers from Australia and NZ, but if you're not going to do that, then at least help promote the UK, as one of its more visible representatives. All in all, the fashion on this trip has been a miss for me. I quite like the idea of the dress, but not the cut-out sleeves or peplum, if that is what you call the pattern on the hips. I thought her make-up beautiful. The hair-do seemed really gorgeous to start with but close-up you see the fastenings and it doesn't look quite as neat as it could have been. Loved Princess Mary's portrait : I am a great fan of her, for her work, implication in Denmark and around the world, and I love her fashion choices : her poise and elegance are impressive. Too bad they couldn't have tucked that wattle diamond brooch into her hair in the back. I think this look ages Kate, more the hair and make up than the dress, which would be lovely without the peplum. Peplum suit curvy girls, great for hiding and accentuating. This looks big on her. Some of her outfits seem random as in 2 bright green coats and wearing the same dress but different colour. I think a stylist would work wonders with Kate, someone who could work with her and advise her, she has great style but everyone would need help with choosing so many formal outfits for a 3 week trip. I also fear we will see a lot of these outfits again and again , when she comes home.i do love checking your blog to get the updates, and seeing what everyone thinks, we get to play fashion police! Nead from Ireland. Hairstyle is wonderful. I see other Lela Rose dresses that would suit her much better (Thanks, Charlotte). This one made me think "Pippa", and not in a good way. I don't care for the sleeves and I'd prefer a shade other than white for an autumn fall cocktail party. Agree this was the time to showcase an Australian designer. No matter what she wears, Catherine is winning hearts on this tour. Someone called her the Kid's Princess, it's a perfect name for her. She has such a natural connection now that she's a new mum. Sad the tour is ending, very sorry to know the next time we see her in the UK might be to attend a memorial service for Mark Shand. Devastating news for William's step-mother. I loved the Lela Rose dress! But then, I liked the pink outfit. This dress I want to have a long-term relationship with. Actually, white is an accepted color of mourning. Charlotte, Lela Rose may be up there with DVF . Maybe it was just the particular items you selected, but I liked every one of them and could see Kate in any of the dresses Thank-you for including the story about Lupo. He was really her first "baby." There was really no need for me to comment at all, as 714 and Rebecca said it all for me. Maybe the Wattle for ANZAC. Would be more appropriate than with a cocktail dress- will she wear black, as for Remembrance Day? I think she looked elegant last evening-lovely dress, gorgeous hairstyle, minimal jewellery. The watch obviously has sentimental value. Shoes...maybe her chocolate brown suede ones? Just not black. I am fashion illiterate,so I probably shouldn't comment on that. And she did.wear the Remembrance Day black! I really liked that coat. I have very much enjoyed your coverage of this tour, Charlotte. Thank you so much! I am glad that Kate has dressed as Kate on this trip, with consideration for the lands and peoples she and William have visited. That authenticity and awareness seem so much more important than experimenting with styles and designers. She has taken care of Prince George's needs, too. It must have been an exhausting and fascinating experience. The most beautiful part of it has been William and Kate's obvious involvement and pleasure in meeting the people of New Zealand and Australia. And I often wonder if royal visits allow for exploration of the lands visited; this one has. One more duty to perform, and the Cambridge family will be on a plane headed home. They no doubt will face a funeral and a wedding. It's time to extend sympathy and congratulations to everyone involved in those occasions. And thanks to you yet again, our favorite blogger Charlotte! I love the dress the hair and the makeup (for the first time), but the watch, the shoes and the clutch are too informal. Kate looked lovely at this final evening reception! She and William shared a private moment, and it seemed he could hardly keep his eyes off of her. He must be so proud of her ability to carry off a demanding tour! I simply love this outfit!!! She looks absolutely gorgeous!!!!! I also liked the green coat wear in the afternoon!!!! They will probably be there, Silvia. I enjoy your very happy posts! First : Thank you for a thorough review of the many days. Just wondering - if this last event was a black tie event, how come did William wear a blue suit and tie? Blue/ black, Kate could have chosen blue pumps and a fancier blue clutch. Mulberry bags are not of high quality. Love her hair! The dress wasn't my favorite, but the halter neckline minus the circle detail I did like on her. Love the dress and the hair, but (forgive me) the watch is to sporty. Otherwise home run! This is the most beautiful Catherine has looked since her wedding day. I adore adore adore her hair like this. I wish she would wear it like this more often. Her outfit is gorgeous. I love Lela Rose's wedding dress styles as well so nice to see Kate in her other style of dresses. I am no fan of Camilla but I wouldn't wish such a horrible tragedy on anyone and I'm sorry for the royals' loss. I loved this dress, as indeed I loved all of her clothes on this trip. Do you have any information as to whether the circles were crocheted? In the close up, they look as though they might be. I love crocheting when it's well done. One more night to go, and then your marathon will be over! I'll bet you're both sad and glad. Hang in there, my friend! I like this look. I don't think it's a total home run, but it's nice to see her trying something a little different. I have no idea how anyone can think this poor girl has gained any weight. She is tiny! Yes -- a white dress with these kinds of details will add "weight," but I think she could use at least 5-10 extra pounds on her super slim frame. I can't imagine that she is pregnant again. She had a tough early pregnancy, followed by what sounds like a "spirited' baby. Add first-time Mom-in-the-spotlight to that, and I hope she waits a bit longer for her own sanity. I think she wears peplums to encourage more of an hourglass shape since she is that rare breed of woman without much of a hip at all. As for the heavy make-up, I think she's exhausted and sad about her uncle-in-law's death. I also thought she looked quite pale in these pics. Time for our beloved Duchess to go home, rest up, and get back in her routine. I will miss these posts -- they are a bright light in my days. Charlotte, how do I wish you were Kate's advisor I like you choices more than Kate's. Sleeveless Beaded Sheath dress is simply beautiful. Thank you for this wonderful blog! Now to this event and the dress - great hair and makeup but the dress, though the colour is so very flattering, looks like a craft project. All those disproportionately largish loopy loops on this beautiful young woman. Is this a result of taking direction from QE2's dresser? Kate. Perhaps this look will work back in Britain. Thank you for the extensive and informative coverage of this tour. I really do like this dress and her hair looks terrific! She looks so sophisticated!! Two thoughts.... IMO the watch is too big for a more formal look and the color of the shoes worn by the model worked better (a softer look overall). That dress is just beautiful. Kate looks fabulous with her hair up. This is another of my favorites. I've really enjoyed seeing Kate's various looks throughout this tour. I think she seems to be taking more risks while staying true to her signature style. After seeing her choices thus far, however, I'm left wondering if those rumors regarding longer hemlines supposedly suggested by the Queen were true after all; I don't think we've seen Kate in anything shorter than knee-length once! Not that it's a problem, just a curiosity. Especially when an older and shorter piece (her red Luisa Spagnoli coat) was altered to a longer length. William and Catherine ,wearing black, were at dawn ANZAC services today. I agree Kate has looked wonderful throughout this entire trip.She is delightful,gorgeous and real! The deserve a lovely rest now as do you Charlotte. At last her hair in an updo style ! This playing with her hair continually is annoying to watch. She has to speak to people all the time on tour so her hair should be out of her face. She is a great asset to R F.
I enjoyed reading this post! As usual =) I do agree that Kate looks quite elegant in the dress she wore this evening, I love her whole look, it is very becoming. I also love the way her eyes look with the makeup she did. It must have been hard for Will and Kate to put on smiles, after receiving the news of Mark Shand. I must say I have loved almost all Kate's looks on this tour and of course I have enjoyed every sighting and outing with Prince George! Very different from the Canadian tour! What a fitting evening to mark the end of their tour. This look is indeed most elegant. In my best moments, I think of the statement I want to make when I select an outfit for an occasion. Truly, the Duchess is called upon often to dress in that manner. Tonight I read her statement as sophisticated elegance with a touch of the unexpected. With her hair in this style, I can look at pictures and see her with a super stylish shorter haircut someday. Only she can say when. After they're home and rested and have time to reflect on the tour, I wonder which events will most be discussed between them?